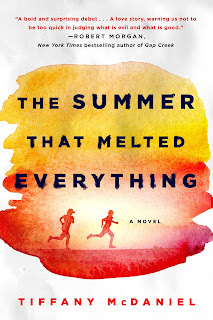 Debut novelist Tiffany McDaniel joins me today to chat about her work of literary fiction, The Summer that Melted Everything. Tiffany McDaniel is an Ohio native whose writing is inspired by the rolling hills and buckeye woods of the land she knows. Also a poet and artist, she is the winner of The Guardian's 2016 "Not-the-Booker Prize" and the winner of Ohioana Library Readers Choice Award for her debut novel, The Summer that Melted Everything. The novel was also a Goodreads Choice Award double nominee in both fiction and debut categories, is a current nominee for the Lillian Smith Book Award, and a finalist for the Women's Fiction Writers Association Star Award for Outstanding Debut. Welcome, Tiffany. Please tell us about your current release. The novel started first as a title. It was one of those hot Ohio summers that I felt like I was melting. Out of true heat, the title was born. I always say I’m inspired by the characters, to write their story, to the best of my ability. It was when The Summer that Melted Everything was published. I should say that while The Summer that Melted Everything is my first published novel, it’s actually my fifth or sixth novel written. I wrote my first novel when I was eighteen, and wouldn’t get a publishing contract until I was twenty-nine for The Summer that Melted Everything. It was a long eleven-year journey to publication, full of rejection and perseverance. After such an uphill battle, seeing one of my books finally on the shelf certainly made me feel as if I was an author. For the most part, I just sit there and type. It’s boring, but out of that, comes story. I’ve been writing since I was a kid. I wrote short stories, poetry, and made little homemade books out of notebook paper and cardboard. I certainly always wanted to write, but as a kid I never associated writing with a job because I never considered it work. My parents had jobs. Hard jobs that made them tired and not a lot of money. I thought that’s what I would have to do with my life, too. Have a job I hated. I wouldn’t have that distinction between a job and a career until I was in middle school. I started on the journey to a writing career when I was eighteen, when I wrote my first novel. I don’t have social media, but readers can always reach me direct through my website. I personally answer every email. I also Skype with book clubs. Having that connection with readers is important to me. Thanks for being here today, Tiffany!